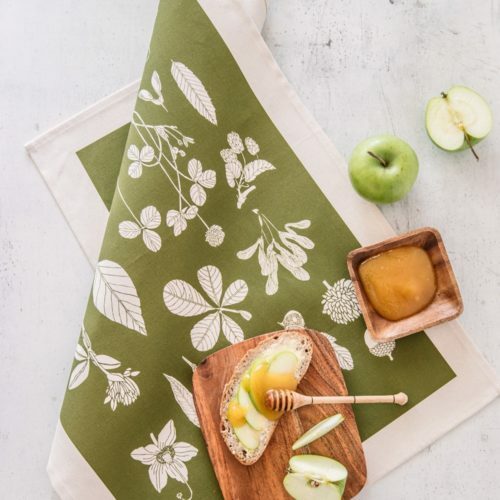 Tea towels, napkins, aprons, oven gloves in natural colours and textures. Ethical and often handmade, these cheerful kitchen accessories will brighten up your Scandinavian, modern or rustic styled kitchen. Botanical apron with large front pockets and adjustable neck strap. Featuring delightful summer fruit and leaves to brighten up your day. Available in a large range of happy colours. Cooking apron in Winter Solstice design, in a choice of two colours. Combines Scandinavian shapes and colours with Eastern European folklore patterns in a 1970s style. Inspired by retro Christmas tree baubles. 60cm X 80cm, 100% cotton apron with pocket. Mix and match with the Solstice tea towel and oven gloves for a full kitchen set. Winter Solstice double oven glove inspired by Scandinavian shapes and Eastern European patterns. It's the perfect style for your Scandinavian Christmas styling. 84x20cm, 100% cotton with towelling back, heat-resistant. Match with the Solstice apron and tea towel for the ultimate Scandinavian kitchen.